What was Hillary’s "Listening Face” showing us? And how a female voice is "heard" as being more emotional than a man’s voice. I was asked to read Hillary's listening face for Poppy Harlow’s show on CNN. I analyzed six hours of video as well as video from her previous hearing and stills that the media used to report on both events. Though my segment was bumped for a press conference about the massive flooding in Texas, I thought I would share what we can learn from a listening face. Whether you love her or hate her you may be fascinated to see how different she was and to note how the media portrayed her. 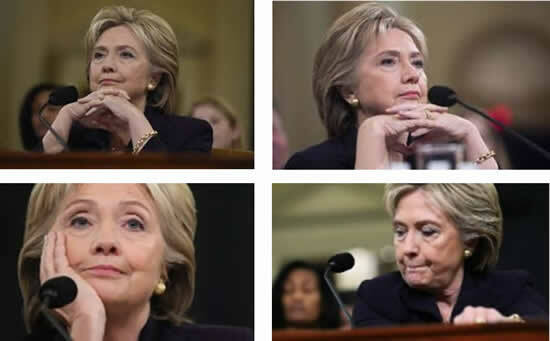 Clinton had to make a considered choice of what her listening face would be during the hearings. There are gender differences in how emotions are perceived. The men questioning her were often loud, raging and abusive. I have seen powerful men in her hot seat be loud and raging and defensive right back. Being aggressive did not serve her well the last time she was questioned about Benghazi and she chose overall to be self-contained. It’s fascinating that many of the editorials have called her cold and uncaring. If she had been too emotional, or specifically, too angry in response to questions she would have been seen as a raging woman. Let’s be frank, as a women, she couldn't yell back without being called the “b” word. If she appeared too upset as key information about the attacks was shared, she would have been seen as an overly emotional woman. Her “listening face” is often a "Cover Smile,” with her lips tightly pressed together and the edges in this case turned down at the corners ever so slightly. A cover smile is an attempt to cover true emotional state; her cover smile is slightly turned down at the corners. If you look at the four stills I pulled whatever you may think of her as a candidate, she did a great job of being neutral. I think the head resting on her hand is more to contain her feelings. She is not bored as the media has portrayed her. She is calm outwardly and inside trying not to laugh at their behavior. Men actually use cover smiles more often than women, and the turn down at the corners is more extreme and if you look at the eyes and the rest of the face you can typically see the emotion they wish to "Cover." See the photos here from my story on men's cover smiles. Hillaryhas upturned full cheeks, her chin is up, along with her tight smiles are more sardonic. She is covering amusement or motherly frustration with their histrionics. I would love to say something about her voice. For years we have heard her voice and I know I have thought it often high and shrill but it was not high and shrill during this testimony. She was very careful through much of the testimony to bring the register of her voice down. This helped her tremendously. Men hear a female voice in a different section of their brain than they do a male voice. They actually hear a female voice in the auditory section of their brain (emotional) so when a man hears female voices they hear it as more emotional than a man's voice. The female voice is actually more complex than the male voice, due to differences in the size and shape of the vocal cords and larynx between women and men, and also due to women having greater natural `melody´ in their voices. This causes a more complex range of sound frequencies than in a male voice. What is interesting is that when a man hears a female voice the auditory section of his brain that is in his emotional right hemisphere is activated so he hears the voice as being more emotional rather than rational. Female voices sound more emotional to men than their own based purely on where they are processed in his head!! Notice how you perceive the emotions of men versus women not only in political candidates, but also in your daily life. This is an expression I call the cover smile. Yes, most people who give this expression believe they are covering their true emotions with a smile. They are giving out many cues that say what they are truly feeling, but they really believe they are doing a good job fooling you and perhaps deceiving themselves in the process. Of course the dog is just being cute, that video of him with the Chi Wawa was a set up. He will tell you all about what really happened in his Oprah interview. Here are the tips so you can learn how to uncover the lies of a cover smile. This cover smile with lips pressed tightly together is typically found in men and I think comes from the need to keep a “stiff upper lip.” This is the expression described when someone is smiling through the pain. And their true pain as this set of body language cues shows is an attempt to hide many intense emotions of sadness, fear and anger. I see it in men who typically have very strong egos and power that are caught and brought down. They have spent their lives covering up their true emotions. 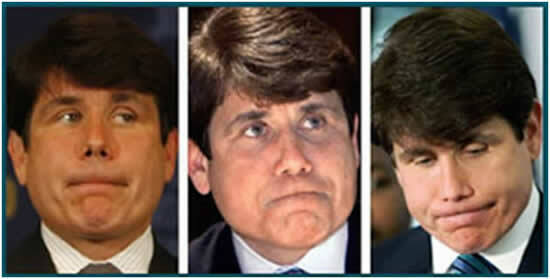 There are several photos above of this expression in former Governor Blagojevich. Look at his chin. See the puckering of the skin. You see that puckering in babies the moment they are about to let a big ole cry. And that is what he would like to be doing, but he has to keep that in. In these photos I am not seeing true sadness, just the desire to cry out. True sadness would be visible with more of a pout, downward pull of the mouth and more puckering around the eyes. The muscles around the inner eyebrow are hard to consciously control. Congressman Wiener’s expression is a suppressed fear, disgust and anger. If you cover up his mouth and look at just his eyes you will see the whites around his eyes and his sideways glance, and wrinkled nose of disgust. The wrinkled nose is a unique movement of the face given in disgust. Symbolically it says I don’t like how this smells and physically it is an attempt to stop the flow of air and odor into the nose. If I knew exactly when he gave that expression, I could tell you whether he was disgusted with himself for what he did or disgusted with the media at a particular question of bringing his behavior to light. The wrinkled, upraised chin and tight lips show the suppression of two emotions fear and anger. 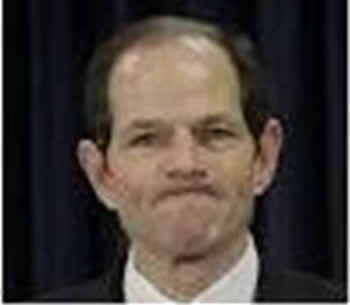 Spitzer also has a cry cover smile. His chin is more raised and more defiant and proud and more of the bottom lip is raised and held inside the mouth. The corners of the mouth come down significantly in a way that is more common to this expression showing his need to smile through the pain. Cover his mouth and you see his eyes are more hooded downwards at the corners and sad. You can also compare it to Paula Deen’s and you can see more wrinkle and pull in his eyebrows. This combination reminds me of the classic sad clown painted face. To train yourself to read the cover smile start watching for it on TV. 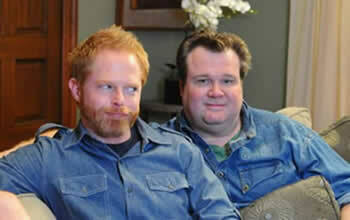 If you want to chuckle while you do it you can watch the characters of Modern Family who often hide their irritation with a cover smile. Here is a funny twist on the cover smile that shows in the character on the left how it can show light irritation and playfulness. My clients in my speaking and consulting business ask me what it is like to be able to read people. Oddly I often think of this expression when they ask, because when you see behind the smile to the true heart of a person you often see their joy, their inner child and pain. The next time you see someone smiling through the pain, you can be compassionate and see the truth of their heart.